Vorige week schreef ik in mijn blog over de arrestatie van Rodney Sieh, de hoofdredacteur van FrontPageAfrica, een van de weinige kwaliteitskranten in Liberia. Gisteren publiceerde de New York Times onderstaan artikel van Sieh. 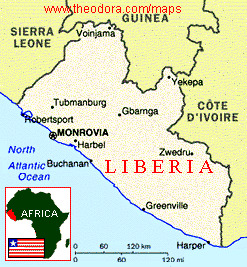 MONROVIA, Liberia — IT’S not uncommon in African countries like Zimbabwe and Ethiopia for newspapers to be shut, and their editors jailed. But the newspaper I edit doesn’t operate in a dictatorship. We are in Liberia, the West’s poster child for postwar democracy building. Our president, Ellen Johnson Sirleaf, is a Nobel laureate who is celebrated by the likes of Bill Gates, Warren E. Buffett and Bono and has positioned herself as a champion of a free press. Having spent the past week in jail and now under armed guard in a hospital since I contracted malaria, I’m not feeling particularly championed. Until it was shut down last week, my paper, FrontPage Africa, had been setting a new standard for journalism in West Africa. Our success has come largely thanks to our business model, which ensures that we can report independently. Our Web site serves the relatively wealthy Liberian diaspora, and advertising targeting those readers finances our operations. Our journalists — led by a team of female reporters, with support from New Narratives, a nonprofit group that trains African journalists — are paid well and they write honestly about issues affecting the vast majority of Liberians, whose voices are rarely heard. We’ve reported on teenage prostitution fueled by demand from United Nations peacekeepers and the growing drug trade carried out by South American cartels smuggling cocaine through Africa into Europe. Our reporting on the health hazards of female genital cutting grabbed international attention when traditional leaders threatened to kill our reporter Mae Azango and her 9-year-old daughter. That story touched off urgent debates and forced the government and development organizations to act. We’ve also exposed corruption. In a country with the dubious honor of being ranked atop Transparency International’s annual corruption rankings, chronicling graft is a daily task. It’s also a constant gamble for journalists. Our office was firebombed in October 2009, and I was jailed briefly for 36 hours in 2011. And reporting on corruption inevitably leads to libel suits. No media outlet here has won a libel case since Mrs. Johnson Sirleaf came into office in 2006. This week we finally lost ours — most likely because we recently exposed a secret deal between members of the Liberian government and the corrupt regime in Equatorial Guinea to make a $130 million investment in an airport. The libel case that landed me in jail began in 2010, when we published the results of two investigations by the General Auditing Commission, Liberia’s independent corruption watchdog, into the Agriculture Ministry’s accounts. The investigations, which Mrs. Johnson Sirleaf ordered, found nearly $6 million unaccounted for and raised questions about the agriculture minister at the time, Christopher Toe, a former president of the American online university Strayer. When Mr. Toe was quietly dismissed from government, he reacted by suing the paper for libel, as well as me and the reporter Samwah Fallah in our personal capacities. Mr. Toe’s defense was that he’d never been prosecuted and therefore could not be at fault. Mrs. Johnson Sirleaf has dismissed but not prosecuted many of the government members identified by the corruption watchdog, because, she has said, she does not believe Liberia’s broken criminal justice system is ready to render a fair verdict. But a civil court eventually found in favor of Mr. Toe, which was no surprise because two jurors admitted to us that they had been paid to find us guilty. We were charged $1.5 million in damages — an amount more than 30 times our paper’s annual operating budget and clearly designed to shut us down. Appealing the ruling would have cost me a $2.2 million bond, and even if I could find that money, there’s no reason to believe an appeal would succeed. Some Supreme Court justices, who have also been targets of our corruption reporting, have told sources that we would never win. When the court’s officers came to ask me this week when I would pay the damages, I had no choice but to laugh. And so here I sit under armed guard in a hospital, supposedly until I find the means to pay the damages. The president, who does not believe the Liberian courts can be trusted, has apparently found trust in this verdict. So long as Mrs. Johnson Sirleaf’s advisers can tell the courts how to rule, the government will continue to intimidate the press at home while maintaining an undeserved positive image abroad. To live up to that image, Mrs. Johnson Sirleaf must fulfill her promise to draft legislation calling for the repeal of criminal defamation and “insult” laws in Liberia, enforce Liberia’s existing Freedom of Information laws and prosecute Mr. Toe and other corrupt officials. Most important, she must enact judicial reforms immediately so that the courts begin to serve the interests of ordinary Liberians rather than just shielding the elite. 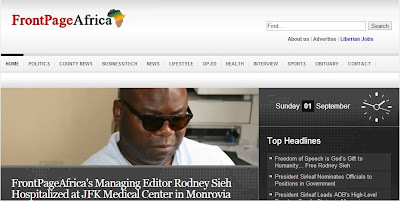 Rodney Sieh is the publisher and editor in chief of FrontPage Africa.